IS YOUR PROPERTY ADA COMPLIANT? Offering ADA & DSA services for most Southern California cities including Orange County & Los Angeles. What is ADA Access? Often also referred to as “Disability Access” or “Handicap Access” by others, ADA Access is short for Americans with Disabilities ACT which was passed in 1990. The main purpose of handicap accessibility is to require commercial facilities as well as public accommodations to become accessible to individuals witdisabilities. “Disability Access Inspection” is when a commercial property hires professional Certified Access Specialist / CASP before they are taken to court for lack disability access to the general public.There are no grandfathering conditions in the act, which means buildings that were constructed prior to 1992 still have to comply and need to be made accessible and reviewed by an disability access specialist. Our Pledge to You – we pledge to have been thoroughly tested on the Americans with Disability Act knowledge of the state of California and federal accessibility standards. With our inspection and report, in addition to inspecting / learning your facility’s accessibility status, you can receive legal benefits if taken to court for lack of access or other non-compliance status. Reviewing your property for lack of accessibility. Saving you thousands in potential lawsuits for lack of access for the handicap. Performing an accessbility survey by a Certified Access Specialist. DSA oversight for all schools and community colleges in Southern California. When cities and commercial companies need professional 3rd party quality control and oversight for large projects. Restaurants, hotels, and more - we inspect all publicly accessible privately owned locations. We review private and public educational systems for disability access. We provide CASp reports for all publicly accessible government owned and managed locations. We provide ADA compliance audits, architectural plans, and construction services - we are a full service company. We provide you constructive counsel, clear processes and ongoing communication. We specialize in: DSA on-site, long inspections, access assessments, with clear plan for transitions. Our Orange County consultants are licensed and certified construction professionals who will understand the complexity of your project early and will counsel your team in advance of any challenges. Martins Bros did a great job with our DSA oversight. We have them contracted with several of our schools within our district. Martin Bros came by our parkinglot and inspected it for lack of handicap accessibility. We use this company for all our parkinglot striping inspections. We hired Martin Brothers Construction Services to review our apartment complex is compliant to the state of California. We recommend them! WHAT IS A CASP CONSULTING COMPANY? A Certified Access Specialist (CASp) is a professional who has passed an examination and has been certified by the State of California to have specialized knowledge of the applicability of state and federal construction-related accessibility standards. A CASp will know which standards apply to your property based on the age of your facility and its history of improvements. While a licensed design professional, such as an architect or engineer, can provide you an access compliance evaluation of your facility, only a CASp can provide services that offer you “qualified defendant” status in a construction-related accessibility lawsuit. HOW DO I FIND A CASP? We can help you with your inspection. You can find an independent CASp on the list by looking for the CASp in your geographic region that states he/she performs inspections. For ease in using the list, click on the “Phone #” link in the gray header of the list, and the list will sort by area code. Those with a “Yes” in the “Do Inspections” column are independent CASps who are available for hire. You may also consult with a CASp by contacting your local city or county building department; however, a CASp employed or retained by a local building department is only authorized to offer information regarding compliance to California construction-related accessibility standards, and not the ADA, and will usually only provide these services for new construction, additions, or alterations submitted for approval for permit. WHAT IS THE AMERICANS WITH DISABILITIES ACT AND HOW DOES IT APPLY TO MY BUSINESS OR FACILITY? The Americans with Disabilities Act of 1990 (ADA) is federal civil rights law that prohibits discrimination of individuals with disabilities and requires all facilities used by the public (public accommodations) to be accessible to individuals with disabilities. Since January 26, 1992, all new construction, additions and alterations are required to comply with the ADA standards. The ADA contains no “grandfathering” provisions. The “applicable construction-related accessibility standards” are based on the age of the facility and/or date of renovation(s): Facilities Built/Renovated Before January 26, 1992 Places of public accommodation constructed before this date are required to remove barriers if it is “readily achievable to do so” – a CASp can help make this determination. Facilities Built/Renovated Between January 26, 1992 and March 14, 2012 Places of public accommodation built during this time are required to be in compliance with the 1991 Americans with Disabilities Act Standards (1991 ADAS) or the equivalent provision in the building code in place at the time of construction or renovation. Additionally, barriers must be removed if it is readily achievable to do so. Facilities Built/Renovated after March 15, 2012 Places of public accommodation and commercial facilities built after this time must be built in compliance with the 2010 Americans with Disabilities Act Standards (2010 ADAS) and the standards of the building code in place at the time of construction or renovation. In addition, accessible features are required to be maintained at your facility. Failure to come into compliance or maintain compliance leaves you vulnerable to having a discrimination claim filed against you by an individual that is denied access to your business or facility due to physical access barriers. IF MY FACILITY ISN'T COMPLIANT WITH THE CURRENT BUILDING CODE, DOES THAT MEAN I HAVE A VIOLATION? While the building code changes regularly, these changes do not cause a facility to become non-compliant. Facilities must comply with both federal and state accessibility standards; however, the current version of state and federal accessibility standards is not necessarily applicable to your existing facility. A CASp will know, based on its age and history of improvements, which version of the code and standards (also known as the “construction-related accessibility standard.”) is applicable for determining compliance of your facility. WHAT ARE THE “QUALIFIED DEFENDANT;” STATUS BENEFITS? You can retain the services of a CASp at any time, however, “qualified defendant” status is only provided if you receive an inspection of your existing facility, a report from a CASp, and have a compliance schedule in place before a construction-related accessibility claim is filed. The “qualified defendant” benefits are as follows: Reduced statutory damages (See “What is my potential liability if I am not in compliance?”; for more information 90-day stay of court proceeding and an early evaluation conference. Additionally, an inspection by a CASp and following the schedule of improvements demonstrates the intent to be in compliance. IS THERE A GRACE-PERIOD FOR COMING INTO COMPLIANCE? For business owners who employ less than 50 employees over the past three years and opt to achieve compliance within 120 days from receiving a CASp inspection of their facility, there is a grace period from liability from statutory damages. In order to receive the grace period, the CASp must post notices at the facility inspected and also notify DSA that he/she has performed an inspection of the facility so that DSA can post such information on a list on its website. For these corrections, any plans going through the local building department are also entitled to an expedited review if the applicant presents the disability access inspection certificate, declares that the project is for the correction of violations as listed in a CASp’s inspection report, and a CASp has reviewed the project plans submitted for permit. WHO HAS RESPONSIBILITY FOR ADA COMPLIANCE IN LEASED PLACES OF PUBLIC ACCOMMODATION, THE LANDLORD OR THE TENANT? While either or both can be sued, the ADA places the legal obligation to remove barriers, provide auxiliary aids and services, and maintain compliance of accessible features at a place of public accommodation on both the landlord and the tenant. The landlord and the tenant may specify within the terms of the lease who is responsible for which areas of the facility, but both remain legally responsible. Landlords (lessors) are required to disclose on every lease form or rental agreement executed on or after July 1, 2013, whether the property being leased or rented has undergone inspection by a CASp, and, if so, whether the property has or has not been determined to meet all applicable construction-related accessibility standards. AM I REQUIRED BY LAW TO HAVE AN INSPECTION BY AN ADA CONSULTANT? There is no law that requires a property owner or tenant to hire a CASp. If you are a business or property owner, your election not to hire a CASp shall not be admissible to prove your lack of intent to comply with the ADA or California law. 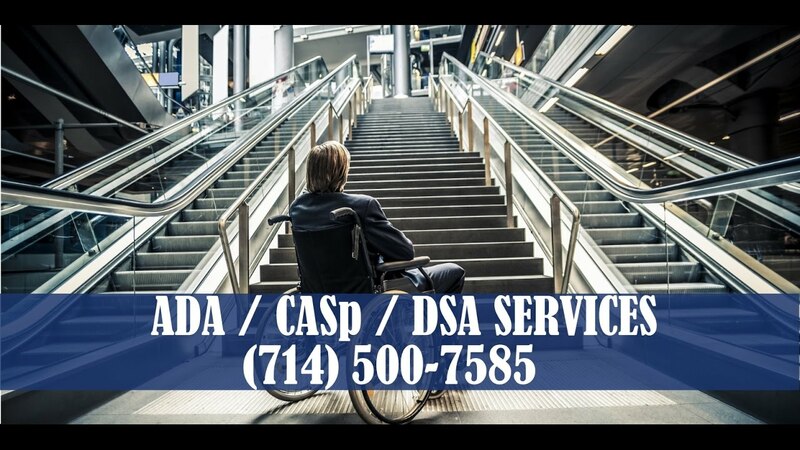 If a CASp solicits your business with threat of legal action of a construction-related accessibility claim if you do not contract for services, you should immediately file a complaint with DSA. WHAT AREAS OF MY BUSINESS WILL A ACCESS SPECIALIST INSPECT? We encourage you to have all areas of your facility that are available to the public included in the CASp inspection. Your “qualified defendant”; status will not carry over to non-inspected public areas in which you receive a claim for a violation. You may ask your CASp for guidance on areas you are unsure of. CASp reports are on public areas of your facility– not areas of your business accessible only to employees. WHAT SHOULD I LOOK FOR IN A WRITTEN AGREEMENT FOR ADA CONSULTING SERVICES? A CASp can provide to you a variety of accessibility services, including providing consultation and inspection of the public accommodation areas of your facility, and plan review of permit documentation. All CASps are required to provide you with a written agreement, which should specify the scope of work the CASp is providing. Most importantly, if you are seeking the services that offer you “qualified defendant” status, then the agreement should, at a minimum, include the following information: Define the public accommodation area of your facility being inspected. State that a CASp inspection report prepared according to the Construction-Related Accessibility Standards Compliance Act (CRASCA, Civil Code §55.51-55.545) State that a disability access inspection certificate will be provided. Include the CASp’s certification number and certification expiration date. Contain a place for both parties to sign the agreement. WHAT SHOULD I LOOK FOR IN A ACCESS INSPECTION REPORT? WHAT IS "READILY ACHIEVABLE BARRIER REMOVAL?" The ADA states that facilities constructed before January 26, 1992, must remove barriers to accessing goods and services that are “easily accomplishable and able to be carried out without much difficulty or expense.” This requirement is known as “readily achievable barrier removal.” An assessment of whether or not removal of barriers at a specific site is readily achievable is a detailed process that should take into consideration the following: Identification of barriers that prevent an individual from accessing goods and services at your business. The scope and cost of measures necessary to remove or mitigate the barriers. Careful examination of the overall financial resources of your business enterprise. You may not want to release the above personal information to the CASp you hire, and many CASps may not be qualified to make such a thorough assessment of “readily achievable barrier removal;” therefore, a CASp may provide to you information on how a determination of “readily achievable barrier removal” is made in order for you to determine if an accessibility improvement is readily achievable. If you or your CASp determine that an accessibility improvement is not readily achievable, you will want to retain any documentation that substantiates this determination in your files, along with the CASp inspection report. WILL THE CASP ISSUE CERTIFICATION THAT MY FACILITY IS COMPLIANT? Certification applies only to a CASp, and indicates that the individual has passed an examination and is certified by the State of California to have a specialized knowledge and application of state and federal laws and standards governing rights of individuals with disabilities. A CASp can conduct an inspection of your facility for compliance to applicable construction-related accessibility standards, but does not, and cannot, issue certification that a facility is compliant, nor can a CASp certify that a manufacturer’s product meets accessibility requirements. A CASp can only issue a disability access inspection certificate, which is a record that a CASp has performed an accessibility inspection of your facility, and that you hold an inspection report and schedule according to the requirements of CRASCA. WHAT IS A DISABILITY ACCESS INSPECTION CERTIFICATE? The disability access inspection certificate (Certificate) is a record of inspection, not a certificate of compliance. A CASp does not certify that a facility meets compliance with issuance of a Certificate. A Certificate is required to be issued to you with a CASp inspection report whether or not your facility is determined to meet applicable construction-related accessibility standards. Business/facility owners should accept no other certificate offered by a CASp other than a Certificate purchased from the Division of the State Architect. Certificates are blue, sequentially numbered, and bear a golden State of California Seal. The Certificate number is recorded by the CASp in a record book maintained for that purpose and identifies that the certificate is issued in conjunction with a specific CASp inspection report. You are not required to post the Certificate at the facility that was inspected, but you should have it readily available to offer it as proof that your facility has been inspected. If you do decide to post the Certificate, you may want to post a color copy and keep the original with the inspection report, as site conditions may cause the Certificate to fade or deteriorate. CASp inspection reports, however, should remain confidential and should only be disclosed after seeking the advice of an attorney. I HAVE A CASP INSPECTION REPORT AND CERTIFICATE. WHAT SHOULD I DO NOW? If your CASp inspection report has a determination of “meets applicable standards”, then the CASp has determined your facility meets applicable construction-related accessibility standards. Keep the CASp inspection report in your records and maintain the accessible features of your facility. If your CASp inspection report has a determination of “inspected by a CASp” you should strive to adhere to your schedule for improvements to come into compliance with applicable construction-related accessibility standards. Keep the CASp inspection report in your records. After improvements to come into compliance have been made to your property, you do not need to obtain a final inspection from a CASp in order to obtain or maintain “qualified defendant” status; however, you may elect to do so to ensure that improvements were made in compliance to the applicable standards. Most important, maintain the accessible features of your facility. DO ONLY RENOVATIONS REQUIRING A BUILDING PERMIT NEED TO BE COMPLIANT? Improvements to existing facilities, buildings, and sites, made with or without a permit, must comply with the accessibility provisions of the California Building Code and the ADA Standards. You should ask your local building department if any proposed improvement requires a permit and/or the services of a licensed design professional such as an architect or engineer. CAN A ADA CONSULTING FIRM REVIEW MY PLANS PRIOR TO CONSTRUCTION? Prior to construction of your building project, a CASp is able to perform a review the drawing plans for compliance to applicable construction-related accessibility standards. A CASp can also provide consultation services on other accessibility issues. While these services will not offer you “qualified defendant” status, you may be assured that planned improvements take into consideration construction-related accessibility requirements. CAN MY CASP INSPECTION REPORT EXPIRE? Your CASp inspection report does not expire and your “qualified defendant” status remains in place provided no additions, alterations, or improvements are made to the inspected area after you have achieved compliance. Improvements made with or without a permit affect the accessibility of the inspected area, therefore, you will need to obtain a new inspection by a CASp to once again become a “qualified defendant.” If your improvement is made with a permit through the local building department, you can request to have a CASp working for the building department perform the final inspection, as this also provides you with the legal benefits of a 90-day stay and an early evaluation conference. IF I RECEIVE DEMAND LETTER PRIOR TO A LAWSUIT REGARDING AN ACCESS VIOLATION, CAN A CASP STILL HELP ME? In the event you receive a construction-related accessibility lawsuit, a review by a CASp of the alleged violations can help determine the validity of the claim(s) and provide information on correcting them. An inspection performed after receiving a lawsuit will not provide you with protections as a “qualified defendant” in that lawsuit; however, an inspection will provide a schedule of improvements for the correction of any identified violations. Ultimately, a CASp can inspect your property for compliance issues at any time. While hiring a CASp after a claim has been filed against you may not offer you legal benefits for the present claim, it can provide you with legal benefits on any future accessibility claim that may be filed against you. Having a CASp inspection and possession of a CASp inspection report prepared according to CRASCA will offer you the legal benefit of “qualified defendant” and may, if you are eligible, offer you a grace period from liability for statutory damages in any claims that occur while you are making improvements, and may reduce your liability from statutory damages for future claims that may be filed on the inspected area according to the DGA.CA.GOV website. WHAT ARE THE SPECIFICATIONS FOR HANDICAP RAMPS? The Americans with Disabilities Act (ADA Guidelines) ADA Ramp Slope, ADA Requirements & ADA Code Guidelines The Americans with Disabilities Act (ADA) provides Wheelchair Ramp Specification, code and handicap access guidelines that most business are required to meet. Most residential applications (please see our residential or light duty commercial Pathway ADA wheelchair ramps) do not need to meet ADA code and ADA guidelines, but they are a good reference point for recommended ADA ramp slope and lengths. Most businesses, churches, schools and other organizations must be in compliance with ADA ramp specifications and ADA guidelines for handicapped wheelchair ramp slope access. Contact your local building inspector for additional ADA compliant ramp information. ADA Ramp Specifications Require a 1:12 ramp slope ratio which equals 4.8 degrees slope or one foot of wheelchair ramp for each inch of rise. For instance, a 30 inch rise requires a 30 foot handicap wheelchair ramp. ADA Guidelines Require a Minimum 5′ x 5′ Flat, unobstructed area at the top and bottom of the ramp. ADA Standards Require wheelchair ramps to have a Minimum width of 36 inches of clear space across the wheelchair ramp. Massachusetts and California ADA code now require 48 inches ramp width to be an ADA compliant ramp. ADA Code Compliance Require a Minimum Turn Platform size of 5′ x 5′. California ADA ramp code now requires a minimum 6 foot (in the direction of travel) platform size. ADA Guidelines for Wheelchair Ramps allow a Maximum run of 30 feet of wheelchair ramp before a rest or turn platform. ADA Ramp Guidelines Require ADA Ramp handrails that are between 34″ and 38″ in height on both sides of the wheelchair ramps.